Most of the world’s white rhinos live in South Africa, but they face extinction due to illegal hunting. "We found one .458 casing, and it seems like there is a bullet inside the carcass. There's nothing else left here," said Frik Rossouw, a senior investigator in the South African National Parks (SANParks) service. "As you can see the hyenas and vultures have done their thing." Rangers found her 10-week-old calf cowering nearby and airlifted it to a nearby sanctuary. "It was so small it could fit in the back seat of the chopper," Rossouw told Agence France-Presse (AFP). Rhinos have been hunted to near extinction since the early 2000s with demand for their horns fueled by Asian consumers who believe the keratin has medicinal and aphrodisiac qualities. It fetches up to $60,000 per kilo on the black market. The rhino was the fourth to be killed in recent weeks in Kruger - the jewel in the crown of the nation's tourist appeal. Barely a mile away from the bloodied roadside scene, another rhino lay dead, leading investigators to suspect they had been killed by the same gang of poachers. "It's the first time we have had a crime in this area of the park so close to the main road," said Rossouw, a seven-year veteran of the park's detective service, as he clutched an assault rifle. "This animal was probably shot at night - the poachers won't take the chance because there's movement all day here." Poachers typically wait for full moons and clear skies to stage their audacious raids into the park, limiting the need for electric light that could give them away to the heavily armed anti-poaching patrols. South Africa is home to around 20,000 rhinos, about 80 percent of the worldwide population and despite recent setbacks, the park says it is making progress in the battle against poaching. "We've reduced the number of animals that are being poached from five a day, and today we can proudly say that we're standing at 1.3 a day," SANParks spokesman Isaac Phaahla said. Armed with an array of detection technologies - some kept as closely guarded secrets - sniffer dogs and surveillance aircraft, Kruger's anti-poaching force is having an impact, its foot soldiers insist. The 54 dogs of the park's canine unit have been at the heart of high-profile victories over the well funded highly disciplined poaching gangs. Dogs are used for their acute sense of smell to locate explosives, firearms and elephant ivory - as well as rhino horn. "A dog handler can spot and identify human tracks," said dog-handler Craig Williams. "But over grass is where your dog picks it up with his nose because he is following scent, not spoor. So it's a team like that," he added, describing canine support as a "game changer" for the park. Air support has also been crucial in helping tackle poaching, according to Andrew Desmet who flies Bat Hawk surveillance aircraft over the two million hectare park. "The role of the airplane is to suppress, the poacher has to hide behind the trees and wait for the aircraft to leave; it will slow them down," said Desmet. The park is now seeking to grow its arsenal by adding the more powerful Fox Bat aircraft to its fleet - as well as growing its dog pack. Another new front in the fight has been an increase in arrests of the kingpins who fund poaching operations - but results are slow. "To arrest the big guys becomes a three-year project," said Phaala. "We've had three high profile arrests... and that shows that at least there's collaboration with the police and it's starting to bear fruit." For those on the front lines like Rossouw, Desmet and Williams, there is hope that the war against poaching is not being fought in vain. Poaching has been a problem hurting the entire African continent for a long time. The latest incident took place in Botswana, where 90 elephant carcasses were discovered with their tusks hacked off, a charity said Tuesday, in what is believed to be one of Africa's worst mass poaching sprees. Rhinos, on the other hand, are facing the biggest problem. Once it roamed Asia and Africa in the tens of thousands. 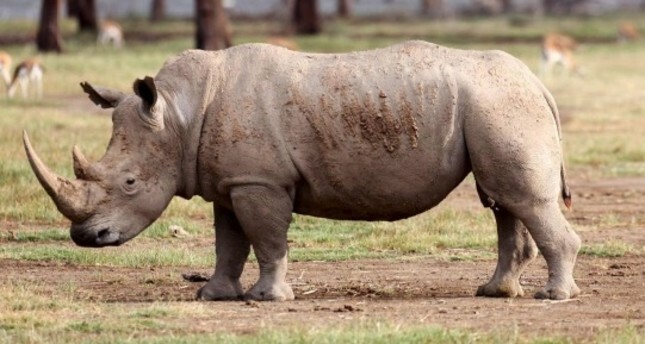 Today, the rhinoceros has been driven to near-extinction due to the increasing demand for their tusks, especially in Asia, starting from the early 2000s. The two species found in Africa are the black rhino and larger white rhino, with genetically distinct northern and southern subspecies. Together they number between 25,000 and 30,000 on the continent today. Kenya is home to one of the largest populations of rhinos in Africa, after South Africa. It also has only two remaining female northern white rhinos, whose species is on the brink of extinction after the last male died in March. South Africa, home of the largest rhino population, has lost over 1,000 of the animals annually over the past five years, according to the group Save The Rhino. At this speed, officials predict that rhinos will cease to exist in a decade.